Address: 120 1/2 1st Ave. 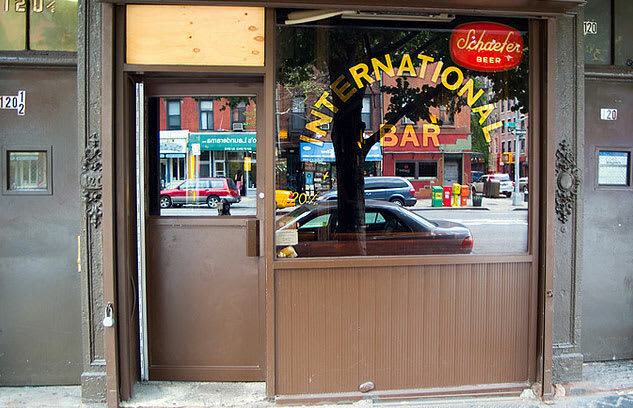 It may be under new ownership, there might be a handful of beers on tap, and the bathroom might have a sink for the first time in ages, but dammit International Bar is still a dive. The martinis (always brimming over) still flirt with rubbing-alcohol-levels of decadence, a bourbon and a beer still costs five bones, and there are more older heads than ever (the remains of Mars Bar have staggered in). If you&apos;re kind, tip well, and come often, you might get a kiss on the cheek from one of the female bartenders.